We'll I cast on (and cast on and cast on and cast on) for the Elann Pacific Waves shawl in the Sonata print in the Rose Garden colorway. It requires that you cast on 541 stitches!!! It took me FOREVER! Then you only reduce the equivalent of about 1 stitch per row for around 60 rows so I'll be knitting over 500 stitches on most of the rows! It is a major accomplishment just to knit one row! I think I will like it though and it's a very easy pattern to follow. 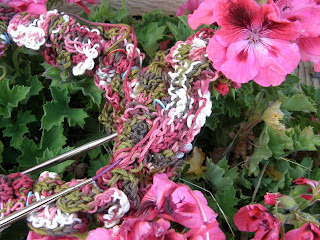 I also started this crazy shawl based on a kit I got at a yarn store shawl kit sale. They put a mix of colors that basically go together in to a plastic zipped bag and then you make whatever shawl you want. There are some patterns that come with it and also my Mom and I bought some additional shawl patterns. I go back and forth between loving this color combination and thinking it's just too wild. I guess we'll have to see how it looks when it's done! You do the most gorgeous photography! I'm sitting here thinking, I need me some dianthus in my yard, and the thought wouldn't have occurred to me before. Any chance I'll get to see the shawl when it's done? Purlescence Thursday nights? Personally I love the colours, but I love wild colour combinations. 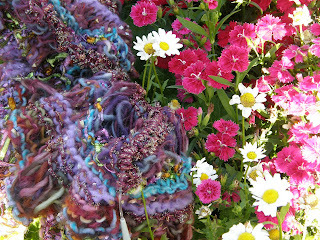 Both shawls look really interesting, can't wait to see progres photos. I'm sure the shawl will be lovely but 541 stitches!? It tries my patience just to think about it. The other looks lovely too - shaws are a good item for wild colors.